Are you a homebrew developer? Got an idea for a new Dreamcast game? Then this could be for you. 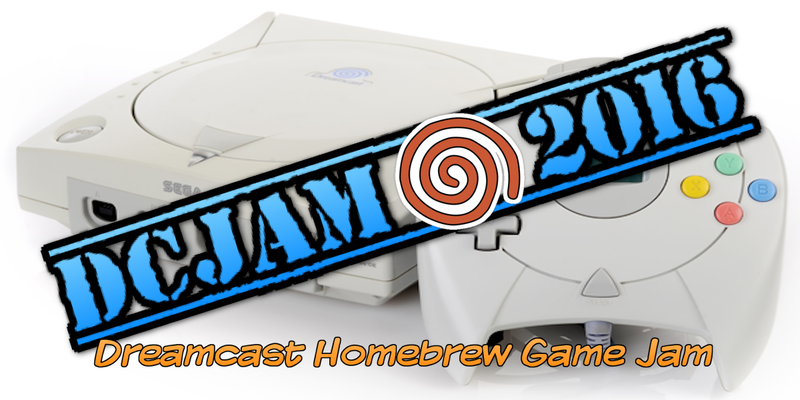 Starting in September 2016 and running until January 2017, DCJAM 2016 is aiming to kick start (excuse the pun) the creative juices flowing through the dreamcast homebrew scene in an attempt to get more bedroom coders putting their ideas into action to create a whole new Dreamcast game jam spread across a period of several months. For those who aren't familiar, a game jam is generally a brainstorming and programming session where coders and designers can collaborate to create new and original software for whatever format the game jam is aimed at...and as you've already read, DCJAM 2016 is aimed squarely at those who may want to have a go at putting a game out on Sega's final system. "Although there have been games released by independent developers on a commercial scale, there hasn't really been that large of a homebrew presence as there was before 2010. In the hopes of getting people interested, I thought that it would be wise to start a Dreamcast Game Jam. The Dreamcast is a great system to develop for, and it's relatively cheap to purchase. The competition will run from September 09, 2016 to January 9th, 2017. Voting will last between the 9th and the 16th of January 2017. After the games are voted on, a compilation disk(s) will be created so that we have a nice collection of homebrew to play with." We've seen some stunning homebrew titles hit the Dreamcast over the years and the community's appetite for new software is as voracious as ever; so if you think you're up to the challenge, why not get involved in this exciting jam session? Check out the rules and join the jam by visiting the DCJAM 2016 site here. This gives me 3 months to port my game engine to the Dreamcast... not sure I'll manage it! I look forward to this!